JULY/AUGUST 2007 -- This is the last chance we have to remind you that the judging for the needlework and craft contests is almost here. All state judging will take place in Good Will Grange Hall, 43 Naubuc Ave., Glastonbury, CT on “Let’s Celebrate Day” - August 25, 2007. Pomona Chairmen, make sure all entries are at the hall between 9 A.M. and 10 A.M. Each item must have an official entry form and identification label in a small plastic bag securely fastened with safety pins. Please accompany your entries with both the Subordinate and Pomona Needlework forms. First place winning entries will advance to the Big E for judging there. Pomona Chairmen, please pick up all other entries after the evening program that day. Have you finished all the requirements to earn your Certificate of Excellence? 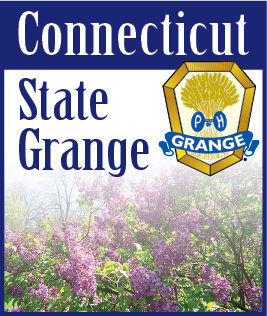 Have you made your monetary donations to our State projects - Connecticut Granger Trust Fund, Connecticut State Grange Student Loan Fund, and Covenant to Care, Inc.? Subordinate Chairmen, send one copy of the annual report sheet to your Pomona Chairman and one copy to the State Director before September 1st. Pomona Chairmen, send your annual report to the State Director, Betty Jane Gardiner before September 15th. The Christmas stockings and small gifts will be presented at State Session to the Foster families. If you have made items to sell at the Big E, you may bring them to the “Let’s Celebrate Day” on August 25, 2007.